[GAME] Make your own constellations! Behold...Karavis, the long-snouted alien donkey in the sky! If you search "Karavis" on the forum, you'll soon find the star and planet catalogs for it. They're in a "Work progress and public beta test" post. Why? Are you worried it'll chase after you or something? SpaceHopper, maybe it's because that constellation looks like a 5-legs creature? That fifth leg is supposed to be its tail. At least it looked more like a tail when I saw it in 0.972. For some reason, a few of the stars got shifted around despite my correctly transposing the RA, declination, and distance from Earth. That's why that ear looks like a horn. The star BET Kâravis was originally at the back of the head. 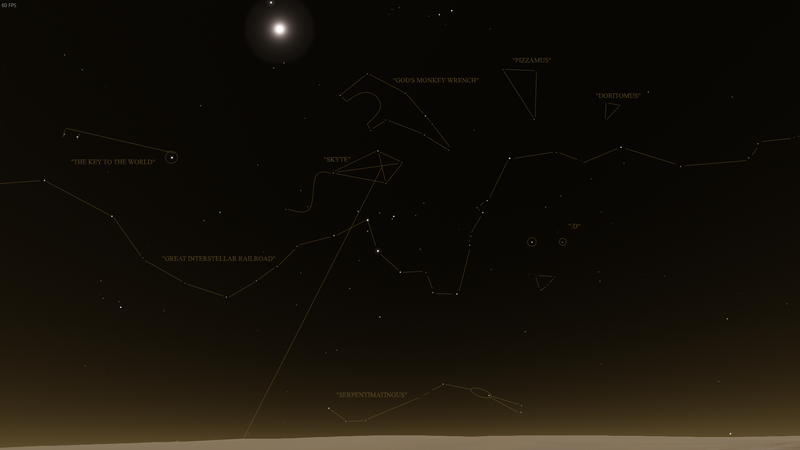 And one of the stars got shifted so weirdly I couldn't quite include it in the constellation anymore. You can see it rather far to the right of Karavis's front left leg. Also, the creature is supposed to be standing on top of the Milky Way. You can't see it very well because I had the planet's atmosphere turned on. Also, the creature is supposed to be standing on top of the Milky Way. show us with the atmosphere off.